Hello everyone! Welcome to my vertical lightning bolt tutorial! You may have already tried its siblings the lightning bolt French or double lightning bolt, if you like those but want to step it up a notch, then this fellow is the right thing. It involves more individual tape strips and precision than the previously mentioned designs, so using it on an accent nail only is recommended if you don't have too much time. But if you enjoy the process as much as the end result, such as myself, why not go all the way for a special occasion? Let's begin! Start by cutting the tape strips. You'll need two triangular pieces and two straight strips. I make them by taking a little piece of tape (±1inch/2,5cm) off the roll first which I then cut in half diagonally for the triangles, or lengthwise for the straight strips. 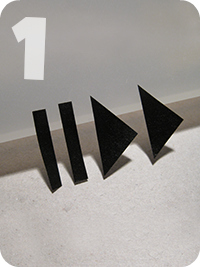 Please note that I only use the black tape you see for the pictures of this tutorial. Normally I use regular stationery tape. The translucency can be a great advantage in some cases, but it makes the tape difficult to capture in photos. Apply your basecolor and leave it to dry. The polish must be absolutely dry before starting with step 3, so you may want to use a coat of quickdrying topcoat to speed things up (or save yourself the trouble and go watch an episode of your favorite TV-show). First I place a straight strip on the surface. It starts at the upper left corner and goes down to the middle of the tip. If the strips are in the right position, carefully apply your layering polish with a thin coat and remove the strips right away. 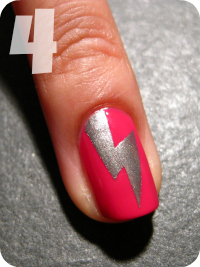 Finish with topcoat and your lightning bolt is done! Prepare to hear a lot of "HARRY POTTER!". Polishes I used in this post are Essence Sending You Kisses and Essence Romeo. Very nice mani...thanks for the tutorial! I didn't even think of Harry Potter until you mentioned it haha! Thanks for the great tutorial, I'll definitely have to try this some time! I'm so excited for this! Definetly going to try this today! Love it! wonderful!!! We love ligthnin bolts. We have some stamping plaques with this design. This looks really cool! I've got a bunch of tape ready to use but the last time I tried something like this I pulled off the base coat as it hadn't dried properly. But I'll try again! Wow, bruikbare tips! Dankjewel. :) Again, lovely tutorial! I totally want to do this if we get a chance to go see our Tampa Bay Lightning team play!! Need to try this, looks great! Beautiful work and great tips to try this out myself, Thank you. Yay!!! Thanks for the tutorial!! Love your manis! And your tutorials are really nice! Those nails are soo badass! love them! These are really neat. I tried a sample on an old coat of polish and it looks great. I used a crackle/blasted coat for the lightning bolt and it gave it a cool kind of distressed look! These are super cute!I did my own take on them and cited you on my blog! Check out my attempt! I think I'm going to try again pretty soon! I tried the vertical lightning bolt over some metallic polish - you can see it in the sunshine, more subtle instead. Thanks for explaining things so well and all the great step by step pictures. I though: "oh my, it´s The Flash!"